After some crazy back and forth emails tossing around ideas, it was decided. We would run for an hour at a time on a high school track, alternating shifts for the entire 16 hours of daylight on the longest day of the year. Why? As a way of turning our passion for running into a fundraiser for The Longest Day – a sunrise-to-sunset event to raise funds and awareness for Alzheimer’s care, support and research. The two of us — best friends from Wisconsin — each experienced the pain of watching Alzheimer’s disease take away one of our grandparents, so this was not only a chance to challenge ourselves through our running but also to honor their memories. Organizing our event seemed really crazy and far-fetched at first, especially since neither of us had ever tackled anything like it before. We worried about the timing. We worried about raising the suggested goal of $100 for each hour that we would be running, $1600 in total. We also worried about how the day itself would go. Would we be running in circles alone all day, exhausted, feeling like what we were doing didn’t matter? In the dark hours of the morning of June 20, we headed out alone to the track, not knowing if we could run the distance and not knowing if anyone outside of a few friends would show up to support us. We felt a huge pressure to complete the entire 16 hours of the event to honor people with Alzheimer’s disease and those that care for them all day long, every single day. We had asked people who pledged to tell us if they were donating in support or memory of someone with Alzheimer’s and almost every single person had a personal connection. We took the names of moms and dads, grandmas and grandpas, husbands and wives and wrote each on a piece of paper that we pinned to our shirt. Every few laps around the track, we switched to a different name, and ran each section in remembrance of those lost. Mother Nature threw us a curveball in normally temperate Wisconsin that day. It was more than 95 degrees, humid, the sun was beating down and a strong wind greeted us each time we rounded the track. It was not an ideal day to run from sunrise to sunset, but we knew the struggle would be nothing compared to the Alzheimer’s battle. What we didn’t know was that so many people would brave the sweltering conditions to support us and our cause. As we set out on the final hours of the day, with heavy legs and blister-covered feet, people started to pull into the tiny parking lot of the track, and one by one, they filtered out to join us. Some ran beside us, some ran just behind us, but we all ran together. As the laps ticked by, we weren’t tired; our legs didn’t hurt. We felt like we were being carried by an army of warriors. We have never felt such a profound sense of community – of solidarity. We weren’t running fast, but we were running. Our fear of running in circles alone all day was unfounded – between the dozens of runners and walkers that showed up, we had at least one person stride-for-stride with us the whole 16 hours! We also successfully met our fundraising goal. Friends, family, coworkers and even complete strangers showed generosity beyond what we had envisioned. Looking back now, so much of the day is a joyful blur, yet so much sticks out in our minds. Watching the countdown clock tick away; grabbing a bottle of Gatorade every few laps to stay hydrated; propping up bare feet after each hour on the track; eating a whole jar of pickles — which was the only thing that tasted good after running for six hours; and reading all of the encouraging texts from friends and family who couldn’t be there. It was such a special day. We really were part of something amazing at that moment in time. This June 21, we plan to run all 16 hours again, switching off every hour, but we want to challenge ourselves to run even more miles than the 76 miles we traveled on The Longest Day last year. In challenging ourselves to push further, we hope that we can inspire others to donate, become advocates and join us in working toward a day when no one has to face Alzheimer’s. We are in it until Alzheimer’s is finished. About the blog authors: Kim Maas and Rachel Degrand are best friends living in Wisconsin. Last year, they ran more than 76 miles as team Running to Remember in the Alzheimer’s Association The Longest Day®, a sunrise-to-sunset event to honor those living with Alzheimer’s disease and their caregivers. This year, on June 21, 2013, they are running even further as part of their commitment to end Alzheimer’s. Way to go, girls! This is what I want to do so badly. I hope that people show up to support my team & I too. Right now I'm worried about not reaching our goal but hopefully we'll get there. I'm a beginner runner but going to do my best. wow! You girls are awesome! I am not a runner, but I would be out there jogging and walking with you! This June 21st, I'll be spending the day with others on our beloved lake skiing, kayaking and boating in general. I wish you the best of luck, the best of fun and yes, we're in it until AD is finished. Well done, girls. I am down in New Zealand, where my mum's exhibiting the signs of early dementia, and I so admire what you are doing. Good on you! Best wishes from Downunder. What an inspiration your story is. Lord bless you for all your efforts and may this year be bigger and better than last year. 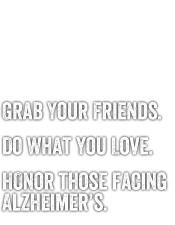 This will be my 2nd year doing the 'Walk to End Alzheimer's' in Bakersfield, CA :}. My husband and I are care provider's for my mother-in-law and it is sad to see her going through the loss of memory and the depression. Keep up the good work. Treating obstructive sleep apnea (OSA), the cause of Alzheimer’s Disease, can improve cognitive function in Alzheimer’s patients, according to a recent report from the AAN (American Academy of Neurology). Just awesome! My mother, strong black mother who raised two boys, my brother and I, and worked many many years for the federal govt. in DC, and to see her wither away at home once diagnosed in 1996 and living at home with her till the end in 2007 is just killing me thinking about it every day. I know she's in a much better and happier place. God bless all for doing this for this to end this dreadful Alzheimer's disease. God bless you for running for such a great cause! I do my best to participate in as many runs to raise awareness as I can, and it’s nice to see others doing the same! Wishing you all the best.